I was recently sent a Mermaid Pudding Sleeve and discovered that there weren’t that many recipes mentioning how to use one. I had never made a roly poly style pudding before and suet never features on my shopping list. This called for some old fashioned British cookery and I knew just the place to look, my grandmother’s old book entitled The Birds Eye Book of Britain’s Favourite Recipes. I had never cooked from it before as it seemed so dowdy and old fashioned (1964) but I knew all the old cooking techniques were covered in there. 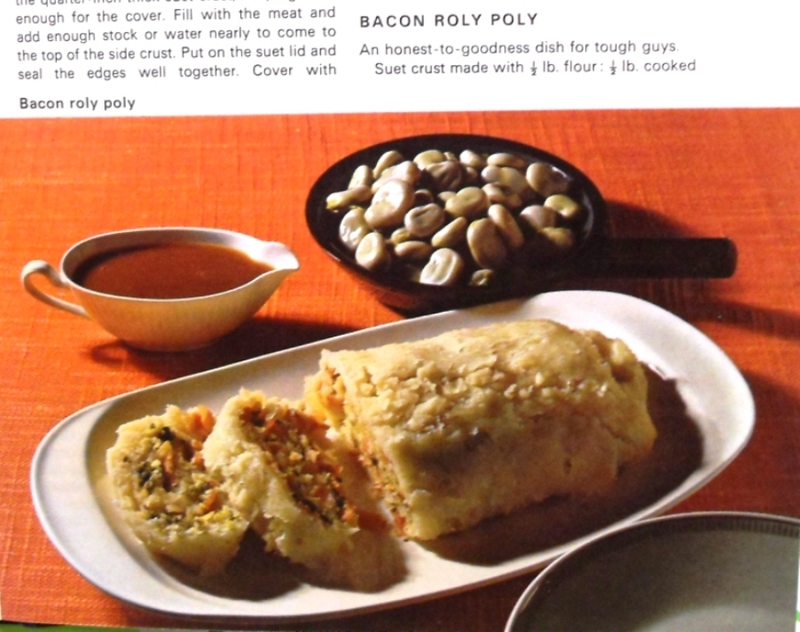 I wanted to find an alternative to the obvious Jam Roly Poly so was pleased to find a savoury dish in the form of Bacon Roly Poly. In the original recipe the onions and bacon go into the pudding uncooked but I didn’t fancy taking my chances with this so fried them up and also added mushroom and changed the onions to red ones. There is mace in the recipe which I bought specially and then promptly forgot to use so if you don’t have any don’t worry as it tasted delicious without! I was very impressed with the way that the Mermaid Pudding Sleeve cooked the Roly Poly as the finished pudding was not like it had been purely steamed. Where the pudding had come into contact with the metal sleeve there was a slightly baked surface which I really liked. 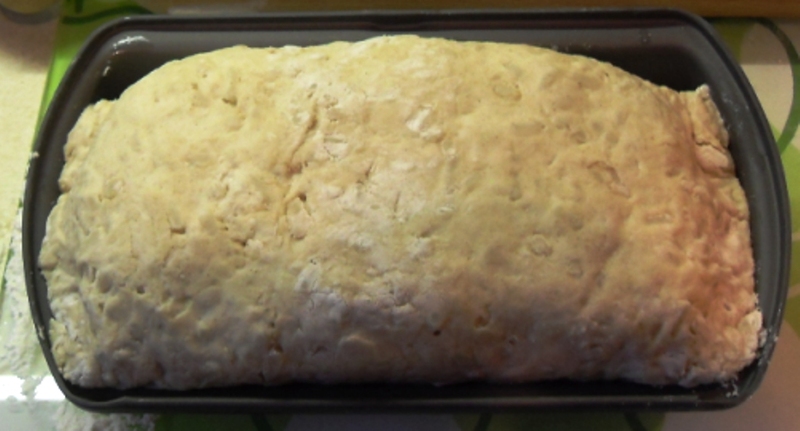 The original recipe was rolled up in pudding cloth and boiled for 2 hours so the texture would have been more spongy which you can see from the picture. Indeed I notice some recipes suggesting that you put your Roly Poly in the oven to crisp it up slightly after steaming – so no need with the Mermaid Sleeve! 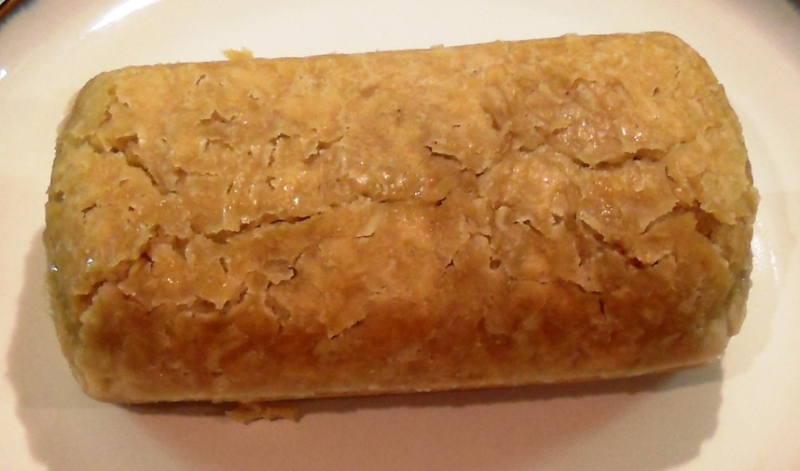 The boiled roly poly had more spongy texture. Dig that photographic style! 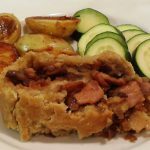 As this Bacon Roly Poly (also known as a Clanger) is made with fairly inexpensive ingredients I am entering it into this month’s Credit Crunch Munch which is run jointly between myself and Helen over at Fuss Free Flavours. I am also entering it into the Tea Time Treats challenge being run by Lavender & Lovage and What Kate Baked (who is hosting this month) where the theme is Perfect Puddings, both sweet and savoury. 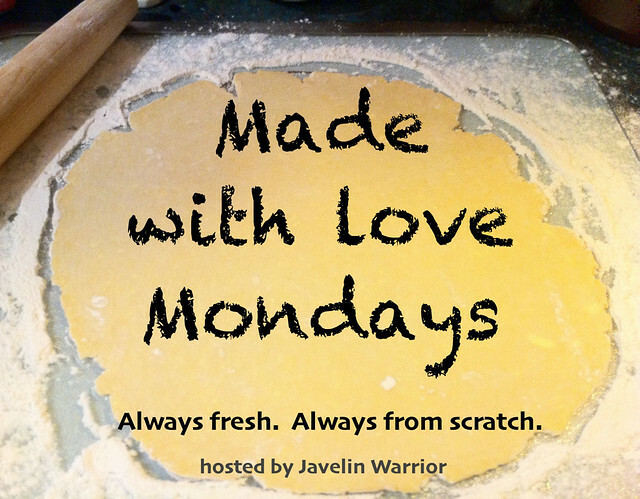 As this recipe is also made from scratch I also have to enter it into Made with Love Mondays challenge hosted by Javelin Warrior’s Cookin w/Luv. 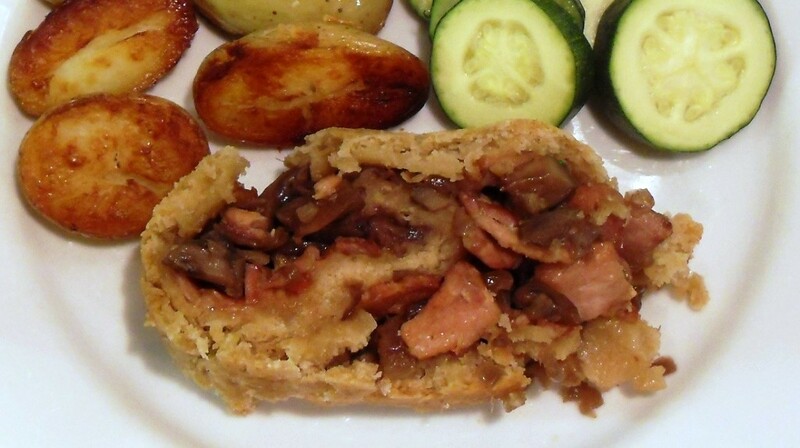 After mixing up and rolling out the dough you simply lay on the fried onion, mushrooms and bacon. After rolling up and sealing the edges with water, place into Mermaid Baking Sleeve. 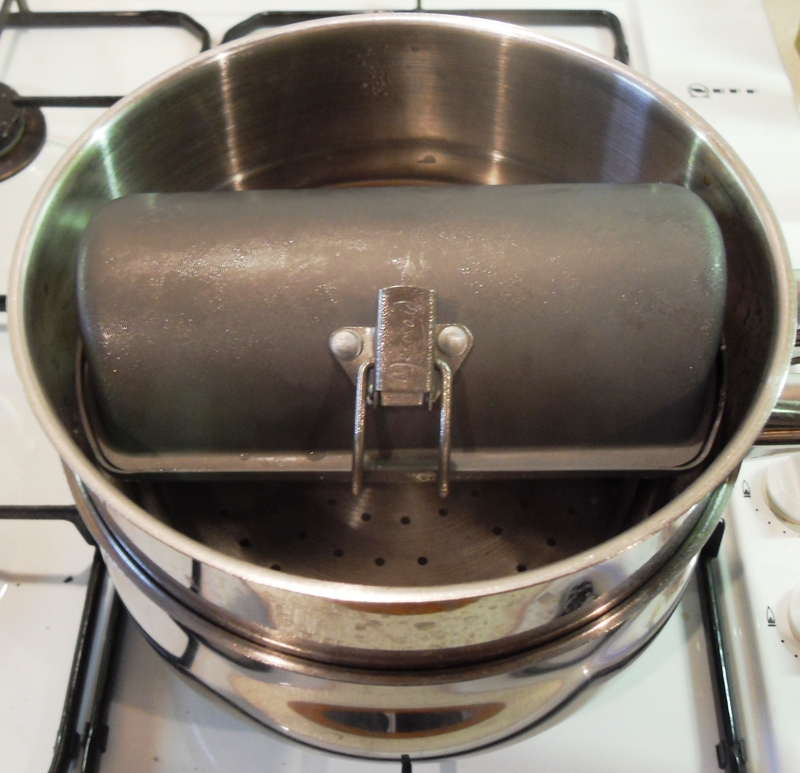 Then simply place in a steamer for 2 hours topping up the water regularly. Then simply remove the Roly Poly from the sleeve and serve. As it says in the original recipe “an honest to goodness dish for tough guys” ! 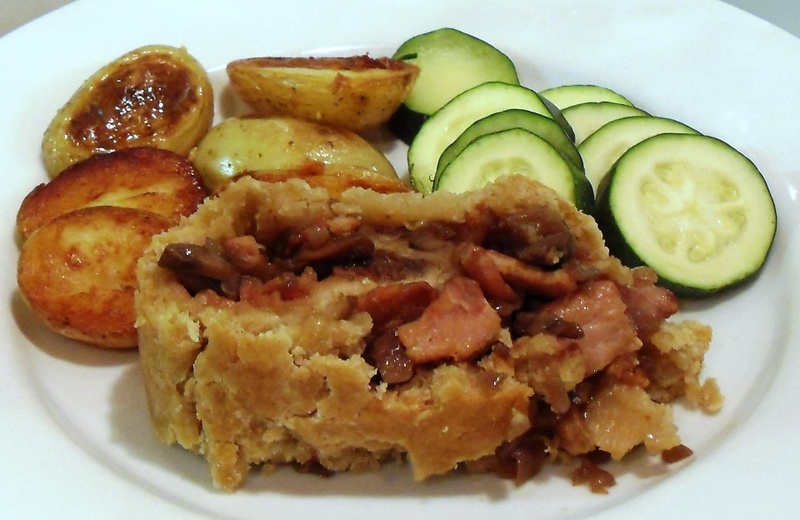 An old fashioned British Pudding brought up to date, bacon, red onions and mushrooms all rolled into a suet pudding casing. Fry the bacon in a large non-stick pan in the oil until cooked and then set aside using a slotted spoon. Sweat the onions on a low heat in the same pan with a lid for about 5 minutes. Stir in the chopped mushrooms and sweat for a further 5 minutes under a lid. Sieve the flour, mix in the salt and suet and then add the water to give a firm dough which comes away from the sides of the bowl cleanly. Roll out the dough to a rectangle shape the same width as the pudding sleeve about 1/4 “ thick. Lay the bacon and onions/mushrooms over the dough leaving a gap along the sides and the bottom edge. Season with the pepper and a little mace if using. Roll up the pudding and seal the sides and bottom edge with a dab of water. Put in pudding sleeve or roll up in a layer of grease proof paper and foil loosely (to allow for expansion) and scrunch foil to seal. Place in a steamer over boiling water for 2 hours topping up the water regularly. Once ready slice up and serve with your favourite vegetables and gravy or tomato ketchup if preferred. Our way of making this is to mince the (raw) bacon with the onion and some sage leaves in a trdaitional household mincer. This gives a wonderful mixture of the flavours and there is nothing to worry about over uncooked bacon because it always is cooked. We dont use mushrooms but thats a family/personal choice. We do however serve it with a cheese sauce as someone else mentions on here and that works really well. Green cabbage and carrots are also a good veg accompaniment .Totally rib-tickling stuff and just waiting for the promised wintery blast to justify having it……. This sound naughty but nice! This looks amazing! I will be giving this a go! Never even knew such a thing as a pudding sleeve existed!!!! Sadly the firm that made them doesn’t exist any more so they are rarer than hens teeth! very different must try it! This looks great, I’ve never seen anything like it before! I’ll definitely be giving it a go! I made this recipe yesterday. Delicious & hubby asked for more. How dare he!! !